Banks Renewables’ Kype Muir Wind Farm near Strathaven, South Lanarkshire is a 26-turbine wind farm with the capability to generate up to 88.4 MW of clean electricity. A key aspect of the planning process for Kype Muir was to provide a solution for the air traffic control systems at Glasgow airport, situated around 28 miles from the site as current radar systems are unable to differentiate between the “radar signatures” of moving turbine blades and those of aircraft. The solution was the implementation of a state-of-the-art radar system upgrade by Terma System which was recently installed at the facility operated on behalf of the airport by National Air Traffic Services (NATS). 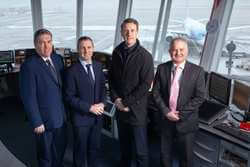 Now Glasgow has become one of just a handful of UK airports benefiting from this advanced level of radar technology. Nexans has finished the project to provide a 16 km 132 kilovolt underground grid connection for SP Energy Networks.